We had a ball today. The weather was set fair as we left our spiritual home of Dent and followed a familiar route along the road out of the village to Church Bridge before following a track east on the bank of the Keld beck and then over fields to Double Croft and then Bridge End. This section and the short road leg that followed to Dyke Hall Lane was our only flat walking on this stage of the Celebration Way as we began our ascent immediately on cutting off the road to follow the Craven Way to the Boot of the Wold. It's what Steve and I both prefer on a walk, to get the major climb over and done with early in the day. We hauled ourselves up 300 metres on the Craven Way track past the Boot of the Wold and stopped as we had planned to at Fold Gill Gutters. We rested after our efforts and planned the next part of the walk for today was our 'Navigation Test!' We had planned this last night. The idea was to hone our navigation skills by crossing open country by using the compass with GPS back up. 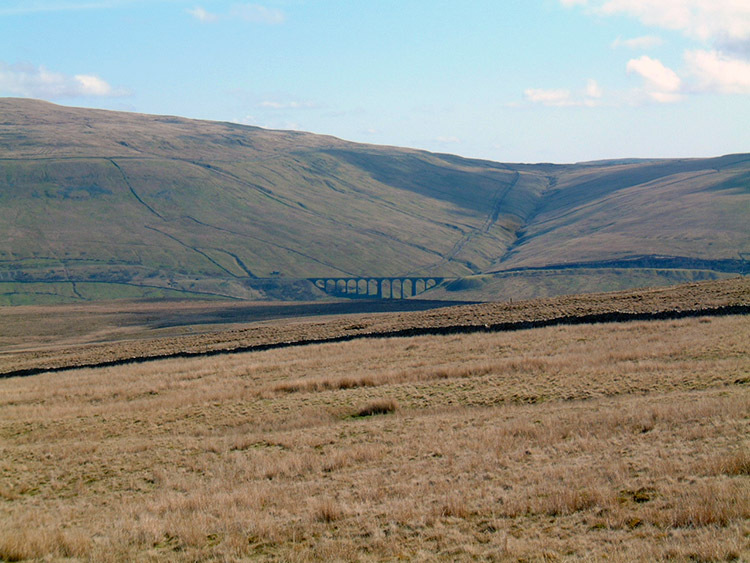 The crossing would shorten the stage by 5 kilometres saving us a good hour by avoiding the walk down Blue Clay Ridge to Ribblehead Viaduct and the laborious mile long road walk from the viaduct along Blea Moor Road to the Cam Hill Road Bridleway. More importantly it would provide a uniqueness to the walk and give us lots of fun. The idea was that I would plot locations from the map. I would then give Steve the bearings to log into his GPS. I would then set the route by compass bearings and lead with Steve's GPS providing the corroboration. And so we set the first bearing from Fold Gill Gutters to the edge of Hazel Bottom Plantation near the disused Blea Gill quarry. The fun began. 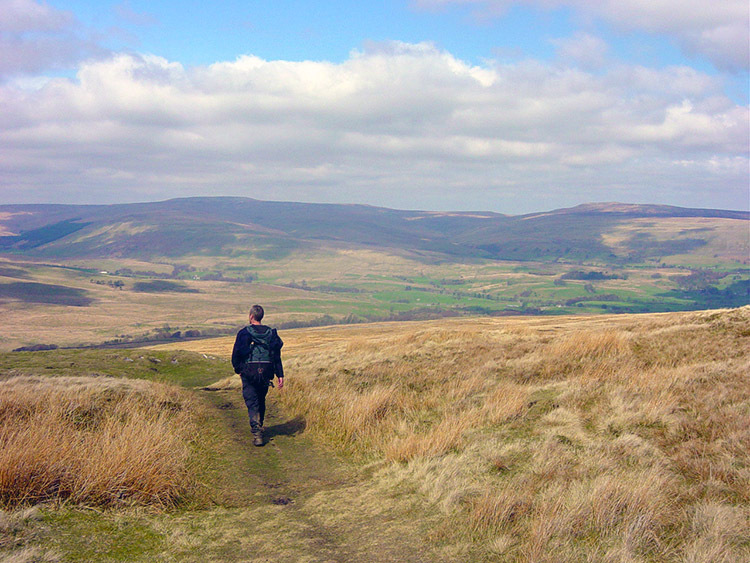 The first stage of our off routing took us over open fell where we lost 100 metres of height. The walking was easy, a little boggy in places especially when we neared the plantation and although a little meandering was forced on us it was never too difficult . We reached our first checkpoint and matched the reading to the GPS. It was within 100 metres but not exact. Steve said "Not bad, but lets see if you can get the next bearing spot on" The second bearing was taken to the far side of Hazel Plantation and then we headed off for it. There was no possibility of getting lost for we were soon to reach the road that links Dent to the B6255. At our second checkpoint we again checked my reading against the GPS. Again it was close but about 100 metres out. Was I slightly miscalculating the magnetic deviation? A third bearing was taken to the junction of the Dent Road and the B6255. Again it was about 100 metres out. From the junction we took a fourth bearing and headed across Gayle Moor on the Ribble Way to some limestone pavements near Gavel Gap. The bearing was again close but once again the now predictable 100 metres or so out. We couldn't fathom it. The map readings I took were accurate on each occasion and we always arrived at the exact point we had set. In fact we were both impressed with our route planning and accuracy. The only puzzle was the slight difference in the GPS point and the point on the map. What is certain is that we arrived at the exact point we had planned for every time. Steve set about reading the instructions to the GPS. I read them too. We couldn't find a reason to alter the settings. The mystery of the 100 metres remains a mystery. Whatever the reason it had not been a problem. we had really enjoyed our cross country cavort over new Dales terrain. After the pavements we joined our original route. We were more than half way on today's stage when we reached Cam Hill Road at Cold Keld Gate. We had also reached the highest point of the stage at 600 metres. 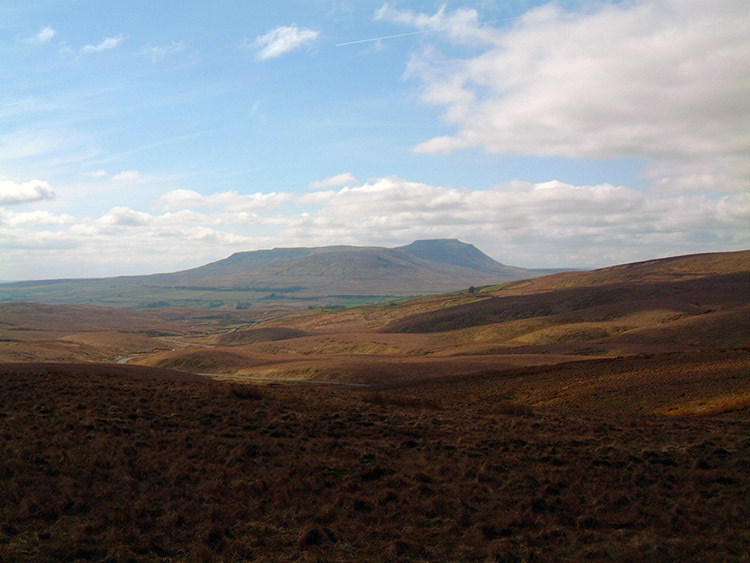 The views were great and we could clearly see our favourite hills Ingleborough and Pen-y-ghent. With the weather being so good (as it uncannily is when I do a long distance walk) we were both in great spirits. The views were super, the walking steady and the conversation between us the usually mix of sensibility and lunacy. The subject matter is diverse but always stimulating. We often delve into Politics where Steve usually goads me about my conservative leanings. A few years ago I had to take it all when his hero Tony was so popular, but now even Steve finds he is at times criticising his champion. To be honest neither of us are radical but the politics often lead to interesting discussion on world or social issues of which we both tend to agree on. Because of our careers Health and Education frequently explode into the discussions. Because of our beliefs we often agree on the same principles although we have approached them from different viewpoints. Our mutual friends are also frequent subjects but don't fret Dave, Chris et alia. It's always positive and usually sparked by recalling a great time we've had in the past. Then of course there are our wives Jan and Lil. We love you but we have to discuss your idiosyncrasy. And finally the lunacy. Steve and I both have an eccentric edge to us and I often find one or the other of us is rambling on about something totally bewildering. "What are you on about" is often a phrase used by one of us in the conversations. It does not stop us. In fact when Dave, the third member of the inner sanctum is with us it's difficult to work out which of us is talking the most rubbish. We all talk a lot! Walking is great when you want to get away from it all, it's a perfect solitude partner. It's even better when you are out with your mates. 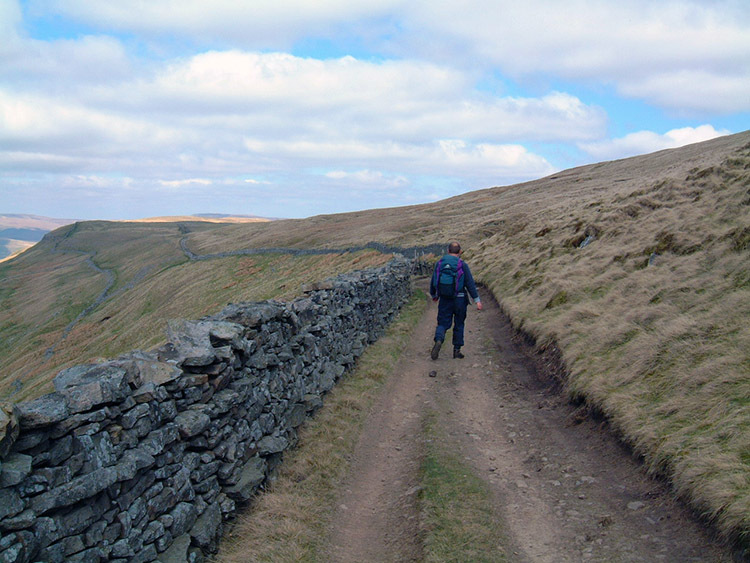 As we ambled on the Cam Hill Road which forms part of the Pennine Way we rambled on eating into the miles. We were about half way on the Dales Celebration Way now and still enjoying ourselves. 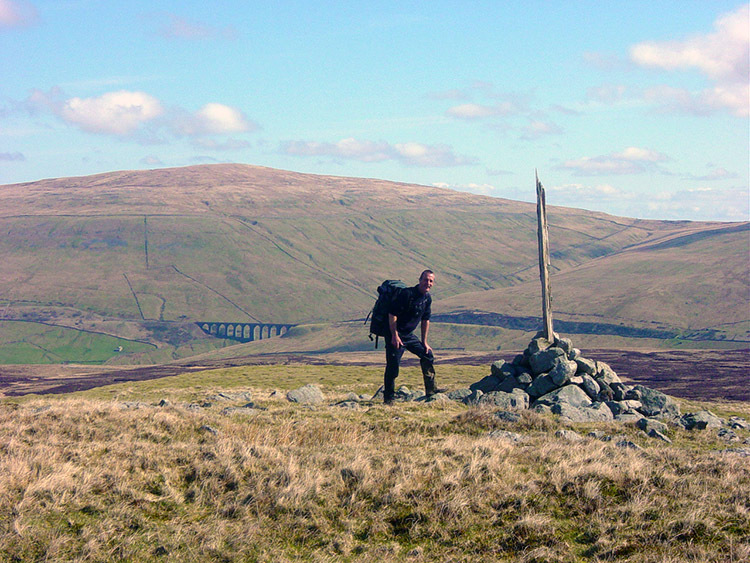 The 'Navigation Test' had been a ball and now the walking was easy. 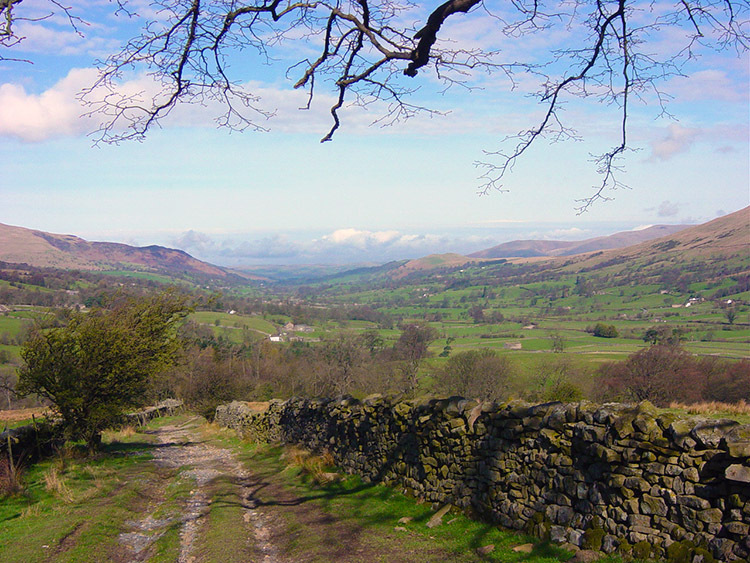 Although the views to our right were suppressed by Dodd Fell Hill we had a great vista of Widdale to our left. I used geographic features to pinpoint our location on the map as we made our way to Ten End Ground. 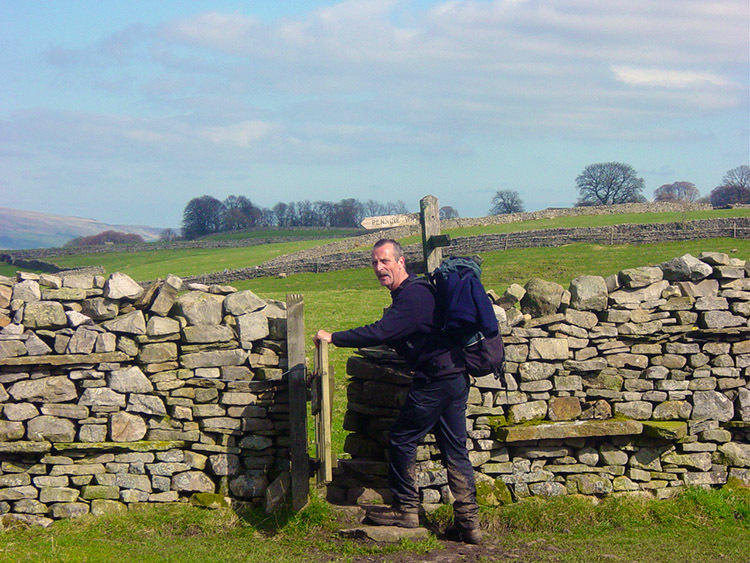 Once we reached Ten End it was no longer necessary as we then began the descent into Wensleydale. Sure enough the views of Wensleydale opened out in front of us while we dropped down the quirkily named Rottenstone Hill. It was around here that we came across Mr Toad who was basking in the warm sun. We made his acquaintance and then continued our descent to Gaudy Lane. As were were doing so we watched RAF jets practicing their low level flying along the valley floor. Steve spotted them first and said "Look ahead of the noise, that's where you will see them". I knew that but had to be reminded. No matter how many times it happens my first tendency is to look directly to where the sound is coming from. From Rottenstone Hill to where we left the rough track at Gaudy Lane we were afforded good views of Hawes, our home for the day. Steve mentioned he had never stayed in Hawes before. Neither had I. We walked onto the metalled road and immediately stopped to meet Mr Horse. He was a friendly chap. We left him and made way towards Hawes. We approached Hawes but there was a final jewel to the day yet to come. The village of Gayle is exquisite with narrow street and beautiful Yorkshire Gritstone built houses. Gayle Beck dissects the village and there is a shallow road crossing where children paddle in the water. True to form a few were doing so when we arrived making the scene a virtual picture postcard. A quaint arched stone bridge crosses the beck a few yards downstream. It is a 'must take photograph' spot and Steve and I both did so. 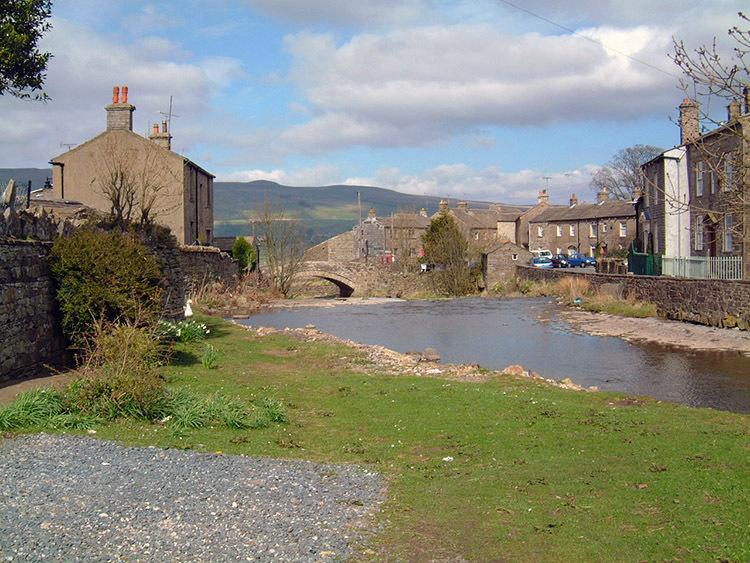 We then resumed our walk through the narrow streets and then made our way out of the village and into the market town of Hawes. We reached the town via a field walk and alongside the town church before walking through an alley into the hustle and bustle of a market day. Traders were making steady business as we passed through the market into our accommodation at the Board Hotel. We checked in and made straight for our room where we crashed onto the beds and relief. Not for the first time we watched Richard Whiteley and Carol Vorderman on Countdown. We seem to watch it a lot on our long distance walks. After the programme we checked the map for tomorrow's route. The next stage to Reeth is the longest at over 20 miles. 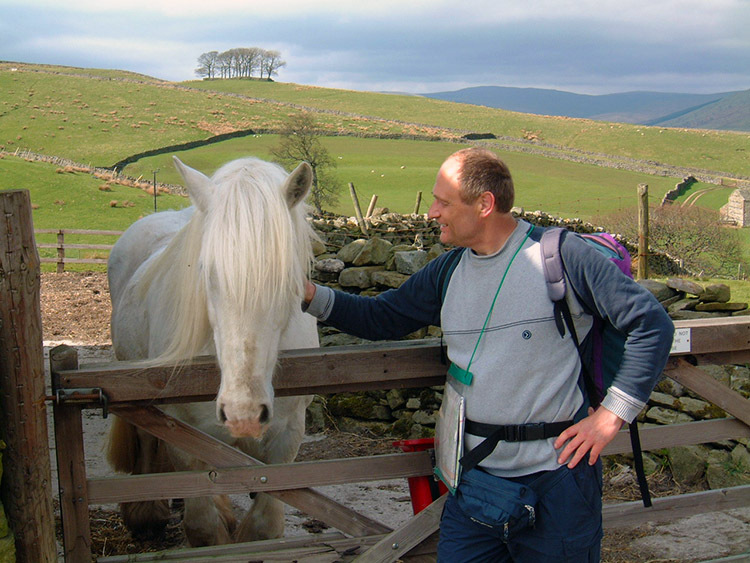 We searched for an alternative route to Great Shunner Fell. We couldn't find one. Before tomorrow there was an evening to enjoy and we were once again to teach some local folk how to play Pool. Steve is a very good Pool player. I am OK and a reliable partner. We nearly always win. We saw off the Hawes challenge 5-0. 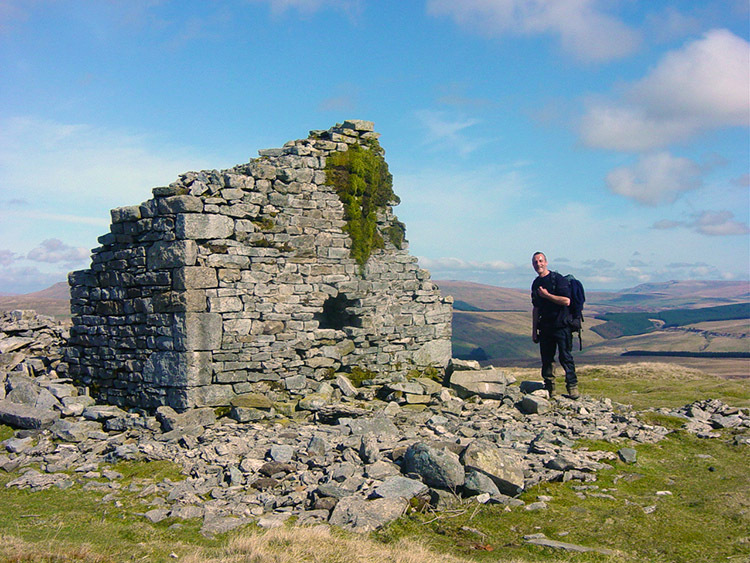 Great Shunner Fell was to prove more a more difficult opponent.